We're sure we aren't the only ones to notice that more and more folks and friends are requiring a gluten free diet recently. It's not something that we've be advised to take on or that we have any interest in trying but as we tend to bake for friends and family, this dietary restriction has been hindering our ability to bring joy and treats to a wider group of taste testers. We've augmented simple recipes to cut out gluten. Cheesecakes are an easy one because you just have to use gluten free graham crackers and we tell you, it tastes the same. It's no big deal, there is no compromise there. But, when it comes to more traditionally gluten based recipes, we've been chickens and shied away. Now, we have a good friend Jamira who is getting married. She is a super sweet girl and we can't be more excited for her. She has been working out the details for her big day and has hit a snag when it comes to the major tradition of cutting and sharing the cake with her groom: she can't eat gluten. It has been decided that the venue will provide the guests with a "normal" cake while she and her groom will share a gluten free version that she will have to acquire. That's where we come in. Jamira has known us long enough to know that we care about what we bake and how it tastes. She has also tasted some of the treats that skipped the gluten necessity. She asked if we might be willing to attempt something like this and Sara showed her the picture below of a cake that we made for a dear friend's milestone birthday. We are willing to take on the challenge and pressure of baking for such an important event when the person is so important to us and we feel that we can fulfill a need. This is one of those cases. We don't bake for money, we bake because we love it. This time, it took a lot of research too. There are a lot of different mixes and flour combinations out there to mimic the flavor and texture of traditional wheat flour. The reviews and comments around the web led us to believe that it all comes down to personal preference. 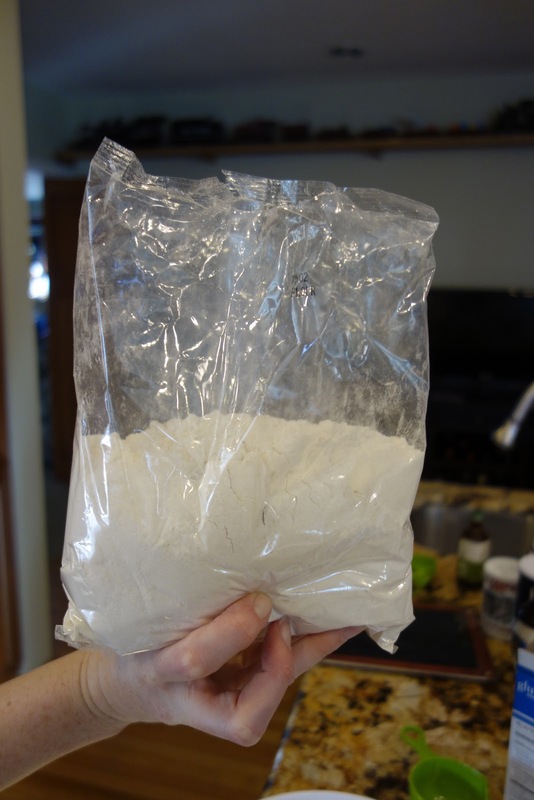 Some people like bean flour substitutes, some people hate them...with a passion. There are myriad combinations of rice flours and others that you can buy and mix. That seemed a bit overwhelming for our first attempt. We decided to try out the King Arthur Gluten Free Flour mix and chocolate cake recipe on their website. It got a lot of good reviews and seemed appropriate for what we were attempting. We found most of what we needed at Whole Foods. They have a big Gluten Free section and that's where we bought the King Arthur mix. 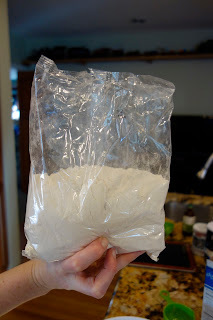 It was about $11 for this much flour. Not so impressive but let's see what it can do. Another major ingredient is Xanthan Gum. It's not major in that a lot is used. It's just major in that it's what is needed for the gluten texture. It's a very very fine powder but it packs an important punch. The only thing that we didn't find at Whole Foods that we were hoping to, was the King Arthur "Cake Enhancer" product. We don't know if it would do much good, but it was suggested and we'd like to try it. We split the batter into two pans to make a layer cake. It looks and feels a little dense when done. You can see by how the crumbs came off, there is some "cakieness" to it but it is not at all fluffy. Then we went with our go-to frosting. It's a white chocolate french buttercream and it's our favorite! When it all came together it looked like a cake, it smelled like a cake, it tasted like a cake...errr ding dong. We think that it must be a cake. Jamira was really happy with the taste test. She had not one, but two giant pieces. We'd be happier if it had a fluffier texture. It may be the inexperience and naiveté about gluten free goods talking but we're gonna try it again and see what we get. Next time, we might try the cake enhancer. We've also heard really great things about Pamela's Pancake and Baking Mix.